LAKEWOOD RANCH, Fla. (Dec. 1, 2016) - Two first half goals set up by Jommar Reyes were enough to earn Lonestar SC U-17/18 (Texas) a solid 2-1 victory against Sacramento Republic FC U-17/18 in both sides' opening game of the 2016 U.S. Soccer Development Academy Winter Showcase at Premier Sports Campus on Thursday. Playing under the early afternoon sun, neither team found much in the way of chances through the first 20 minutes. Given the humid conditions, Lonestar chose to sit in and pick their moments going forward and finally broke through in the 26th minute. After a build-up down the left, Reyes lobbed a cross into the path of Christian Soto-Mendez, who beat the Sacramento Republic goalkeeper to the ball before slotting into the empty net. Ever active in midfield, Reyes helped Lonestar double their advantage seven minutes later when he intercepted a pass in the center circle and quickly transitioned into attack. As he sent Republic FC defenders back pedaling, he played a well-timed ball into the path of Luke Thompson who made no mistake, sending his effort inside the lower right post in the 33rd minute to take the Texas side into the break with a 2-0 lead. Lonestar SC head coach Ron Dennie had high praise for Reyes, who is in his first season with the club after winning a Development Academy National Championship this past summer with FC Dallas. "Jommar is a special kid that's added a lot of experience to our squad this season," Dennie told ussoccerda.com. "He's been at the highest level here. He's won a championship. He's the brain - he's me (the coach) on the field - directing and leading. He's a classic box-to-box player and just brings a lot of maturity to the team." Sacramento found more chances in the second half, first coming close in the 70th minute when Alexis Dionicio's cross found Giovanni Aguilar in the box, but the Republic FC midfielder couldn't get a clean touch to finish. Putting Lonestar on their heels for much of the half, Sacramento threatened again late when Younes Dayekh's low cross from the right found Camilo Rodriguez, whose one-timed effort at the near post was pushed out for a corner kick. On the ensuing take, Dionicio's inswinging ball from the right picked out Dayekh, who headed down at the back post to earn a consolation goal in the 87th minute. Despite ceding a lot of the play in the second 45 minutes, overall Dennie was happy with how his team saw the game out. "The first half we sat in a little bit and wanted to counter attack a bit. We knew they were going to have a lot of possession. We wanted to conserve some energy and see what they were about and it worked. The second half was a little bit different. We really wanted to go get a third goal, but as it wore on, we had to defend and defend and we gave one up, but did well to make sure we got the win." 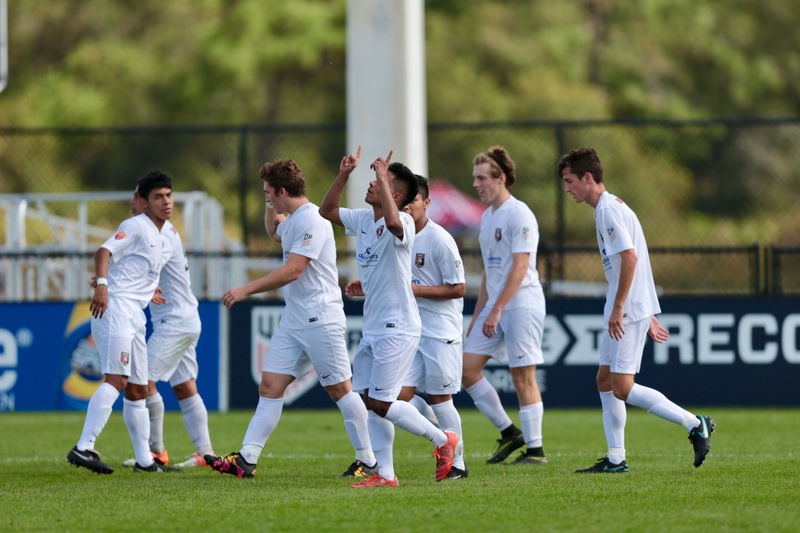 With the victory, Lonestar SC U-17/18s move to 6-1-1 on the 2016-17 Development Academy season and will next face Orlando City SC on Friday afternoon at 3:15 p.m. ET. Sacramento Republic FC moves to 6-5-2 and will hope to bounce back against Colorado Rapids at 1 p.m. ET Friday.